The focus of this volume is research carried out as part of the program Mathematics of Planet Earth, which provides a platform to showcase the essential role of mathematics in addressing planetary problems and creating a context for mathematicians and applied scientists to foster mathematical and interdisciplinary developments that will be necessary to tackle a myriad of issues and meet future global challenges. Earth is a planet with dynamic processes in its mantle, oceans and atmosphere creating climate, causing natural disasters, and influencing fundamental aspects of life and life-supporting systems. In addition to these natural processes, human activity has increased to the point where it influences the global climate, impacts the ability of the planet to feed itself and threatens the stability of these systems. Issues such as climate change, sustainability, man-made disasters, control of diseases and epidemics, management of resources, risk analysis, and global integration have come to the fore. 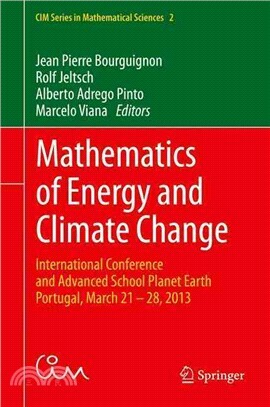 Written by specialists in several fields of mathematics and applied sciences, this book presents the proceedings of the International Conference and Advanced School Planet Earth, Mathematics of Energy and Climate Change held in Lisbon, Portugal, in March 2013, which was organized by the International Center of Mathematics (CIM) as a partner institution of the international programMathematics of Planet Earth 2013. The book presents the state of the art in advanced research and ultimate techniques in modeling natural, economical and social phenomena. It constitutes a tool and a framework for researchers and graduate students, both in mathematics and applied sciences.